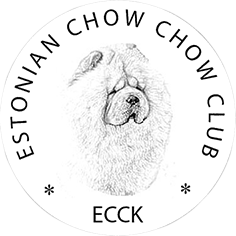 The Estonian Chow Chow Club (ECCC) is happy to welcome you on this website. ECCC is a non-profit organization formed in February 2016 with the aim to promote and protect the unique breed of Chow Chow. ECCK is a member of the Estonian Kennel Union. Our club is open to chow chow breeders, old and new pet owners and people simply interested in the magnificent breed of Chow Chow. We provide a breeder referral service to put people in touch with reputable breeders and we're there to give advice on care, feeding, health, grooming, showing, training and responsible breeding. 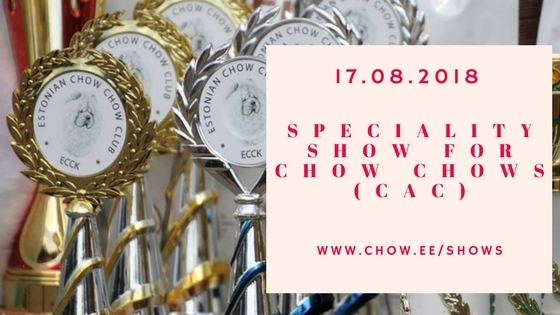 The Estonian Chow Chow Club also organizes different social events including Speciality Shows, educational workshops and seminars, trainings, fun play days and hikes. ECCC members are diverse representatives of society brought about by a passion for the Chow Chow. Each member contributes a unique insight so that the breed as a whole can move forward. Any individual who subscribes to the purpose of the club is eligible for membership. We offer discounts for members taking part of dog shows and any events organized by ECCC, displaying puppy advertisements on our webpage for free, displaying champion dogs on our webpage. As a member of a Club you are entitled to receive the latest news of the breed and the Club. You are also entitled to attend the Annual Meeting and are authorized to exercise a vote in elections or on issues. As a member you are a part of the community where you can share your passion for the breed and develop friendship.